A new fleet of 43 custom river barges ordered by the city of San Antonio, Texas, from Superior, Wisconsin-based Lake Assault Boats for operation on the San Antonio River Walk, are powered by electric propulsion systems from Torqeedo. Each 27ft vessel is driven by a complete Torqeedo electric propulsion system, including a Cruise 10.0 electric outboard engine and 16 Power 26-104 lithium batteries. 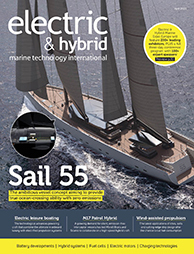 The system is designed for automatic recharging with a built-in shore power connection on board. The Torqeedo propulsion systems are designed to be virtually maintenance free with minimal downtime. The Torqeedo Cruise 10.0 outboard engine provides 12kW peak output and 10kW continuous output, equivalent to a 20hp combustion engine. The propulsion system includes remote throttle and steering connections and an integrated onboard computer with GPS-based range calculation. The new barges typically cruise at 4.6mph (7.4km/h) and can operate up to 12 hours without recharging, according to the barges’ operators. The barges seat 40 passengers and can be configured to support multiple roles for tours, dining, water taxis, entertaining and special events. 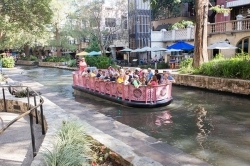 The San Antonio River Walk is a network of walkways along the banks of the San Antonio River lined by restaurants, shops, bars, theatres, museums, parks and the city’s major tourist attractions. Torqeedo is part of the Deutz Group, a leading independent supplier of diesel and natural gas engines. Lake Assault Boats is a subsidiary of Capstan Corporation, which is also the parent company of Fraser Shipyards.